The family of Captain Ogbonna Akpa Nwota of Amikpa, Umudomi, Onicha, in Onicha Local Government Area of Ebonyi State is in a state of dilemma. So also are his kinsmen. Is their son, a soldier with one of the units fighting Boko Haram insurgents in the North East, dead or alive? Nobody can say for sure. Their dilemma started after the fatalities suffered by the Nigerian military following the deadly attack by Boko Haram insurgents on troops at Metele, Guzamala Local Government Area of Borno State, on November 18, 2018. The attack, which has come to be known as the “Metele massacre,” has seen various sources, including a surviving soldier, in a recent newspaper interview, reeling out casualty figures, ranging from 100 to 200, killed or missing, but so far the Army authorities have officially admitted only 23. But for Mrs. Grace Nwota, a widow in her sixties (whose son, Captain Nwota, is among the troops of the 157 Task Force Battalion fighting the insurgents in the North East), and the farming community of Amikpa, Umudomi Onicha, life has never been the same since the attack as they are yet to know the whereabouts of their illustrious son. Was he among the infantry soldiers said to have scattered and run into the bush and perhaps missed their way during the attack? Or, is he among those whose dead bodies are said to be still lying in the bush and yet to be recovered and given a decent burial? Nobody can say for now, what the true situation of thing is with the valiant soldier. When Saturday Sun visited the family house at Umudomi on Monday, the devastated mother was yet to come to terms with the situation of things as they had neither heard from her son nor the military authorities, two months after the reported massacre. Mrs. Nwota who had suffered widowhood in her early stage in marriage is praying that such misfortune should not befall her daughter-in-law whose marriage is less than eight years old. The atmosphere in the community was one of mixed feelings especially as nobody could actually say the state of the missing Captain. “I am just praying to God to let this cup pass over me,” Mrs. Nwota said. “As you see me here, I am finished; my blood pressure has not come down since we heard of the attack in that place. Our problem now is that nobody is talking to us. Even our village union has gone to Enugu to see the Army people but they didn’t tell us anything. So, I’m begging that they should tell me if my son is dead or alive. In fact, initially, when our presence in the community attracted the attention of the natives including the leadership of Amikpa Development Union (ADU); Umudomi, Igboeze Onicha, they thought that we came with some good news regarding their missing son. But when they realised that we were not from the military, the Chairman of ADU, Chief Agom Okorie, begged Saturday Sun to help the community tell the world their plight. He followed up his appeal by handing to us a copy of the letter they wrote to the military authorities requesting to know the whereabouts of their son. The letter titled: “Request for clarification on the ‘state of affairs’ of Ogbonna Akpa Nwota N/13244 of 143 Battalion”, and submitted at the 82 Division of Nigerian Army on December 19, 2018, reads: “The above-named officer of the Nigerian Army is our son, brother, husband, father and uncle, hence this request. “Sequel to the Boko Haram attacks on some of the Army locations within that region, much tensions and anxiety enveloped the family members and our entire clan. This is because he has neither reached any of the family members nor his phone available to our ceaseless attempts to call him. This one-month of incommunicado has resulted to a cloudy and uncertain future for the family. This has made the upkeep and general management of the wife, children and aged mother, presently impossible. “In the light of the foregoing, we are constrained to request for clarifications on the whereabouts of this officer -Captain Ogbonna Akpa Nwota N/13244 of 143 Battalion.” The letter was signed by Chief Gabriel Utara (Patron), Chief Agom Okorie (Chairman), Chief Chukwuma Agbafor (Vice Chairman) and Mr. Ikechukwu Utara (Secretary). 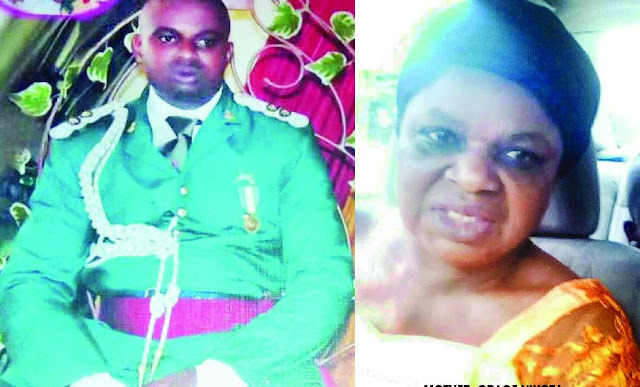 Okorie, like the aged mother of the missing officer, believes that their son is still alive and, is, therefore, begging the Army high command to open up on his whereabouts. Saturday Sun gathered that the missing officer is the breadwinner of both his immediate and extended families. Later our correspondent traced Capt. Nwota’s wife, Mrs. Nneka Nwota to their residence in Abakaliki, Ebonyi State, where she lives with her two kids, aged six and one. Although she declined to speak at length on the matter, the distraught teacher disclosed that she spoke with her husband at about 3pm sometime in August 2018, which incidentally happened to be the first birthday of their second son. According to her, the husband, in a video call, was in high spirits. He asked after the family, played with the kids and sang birthday song to his little boy. “The last time I saw my husband was in August 2018, about three months before the incident. Somehow, he spoke to us in the afternoon of that fateful day; incidentally, it was our last baby’s birthday, so he called to wish him happy birthday,” Nneka said. Hope runs eternally in man’s soul. Like every other member of the family; Capt. Nwota’s wife is very hopeful that her husband would still re-join the family. Not leaving anything to chance, the family has also through their counsel, E.H. Ugochukwu Chambers, appealed to the Chief of Army Staff, Lt. General Tukur Buratai, to save them from the trauma they are passing through by providing information about their breadwinner. In a letter dated December 18, 2018, and signed by Ugochukwu Ezekiel-Hanks, he accused the Army of keeping silent even when various attempts had been made by the family to extract useful information from the authorities. “This confusion which continues to exacerbate the pains of our client is not helped by the total silence of the army, under your command, as to the condition of a commissioned officer in the service of his beloved country”, the lawyer wrote. He also said that the situation was further aggravated when some officers and soldiers that died in the unfortunate incident were recently buried and some of their family members were notified. Saturday Sun was told by a family member that the missing officer, who turned 37 on December 13, last year, was billed to proceed to the Command and Staff College, Jaji, this month, but was sent on special posting to the North East. The source also disclosed that Capt. Nwota has been fighting in the troubled region for over four years. Precisely, two months after, the hope of the family has been hanging in the balance as they wait to hear from the military.